What I know about antique or vintage furniture could probably fill a thimble therefore it is making finding a missing dining chair like searching for a needle in a haystack! I am hoping that through this posting someone with greater knowledge than I will stumble across it and give me some hints as to the make, model, and origin of my newly acquired dining suite. Last week I dropped by a favorite local furniture consignment store to browse, instantly, I was transported back into the storybook pages of my childhood as I gazed at a table and chairs that sat before me. Something about the sweetness of the set reminded me my great aunt Ruth. Baby Ruth we called her because she was all of 4 foot 9 inches tall. The suite greatly resembled one that graced her home. It made me think of warm kitchen smells, afternoons of fresh baked oatmeal apple raisin cookies and milk. It made me think of her high pitched laughter that would ring like merry tinkling bells. It made me think of sweet wreathed smiles and sharing happy stories around just such a table. Everything was always better sitting at a Goldilocks and Three Bears kind of table and chairs with Baby Ruth beaming at you. Just for curiosity's sake I tipped the price tag over and gaped, seriously? THAT is the price? The store owner saw me admiring the set and came over and flipped the tag over and said she would knock off another $25.00 if I would consider it, after all, it was missing a chair. I am thinking to myself, don't let her see you sweat or jump for utter joy, keep it cool, calm, and collected all the while I am texting Handy Hubby as fast and as furious as I could sending snapshots into cyberspace and telling him to get the truck here while I pay the lady! He met me later in the day to look it over and we agreed, our cottage needed a Goldilocks and Three Bears kind of table and chairs, of course he gets the captains chair being the Papa Bear and all, I readily agreed so we brought the sweet little suite home. 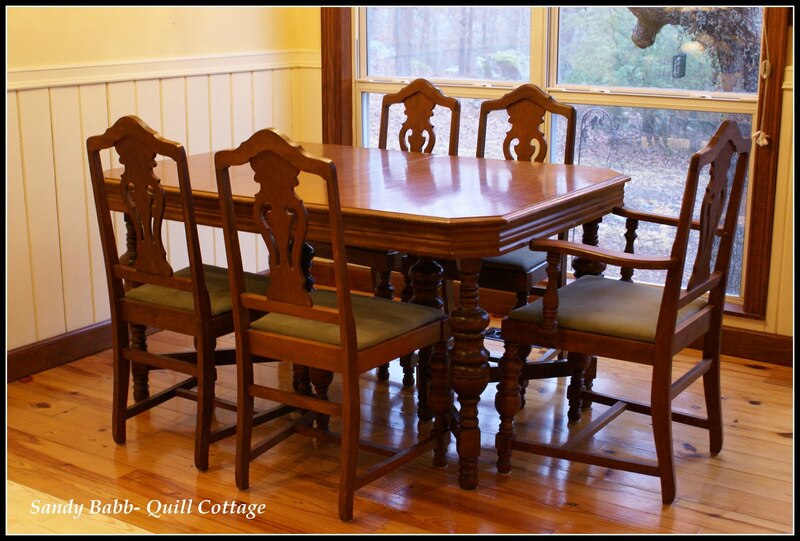 Here is what I think I know about them, I think this is considered to be of the Colonial Revival Style or Federal Style which is a reproduction of original American furniture that was produced from 1620-1780 and based on English pieces. My little suite would have been produced somewhere between 1920-1940. This style was at its popular peak in the mid 1920's and production tapered off in the mid 1940's. At auction the suite would be valued at about $450.00. Let's just say I feel like I stole this set paying less than one forth that value. The set originally came with five armless chairs and one captains chair with arms. 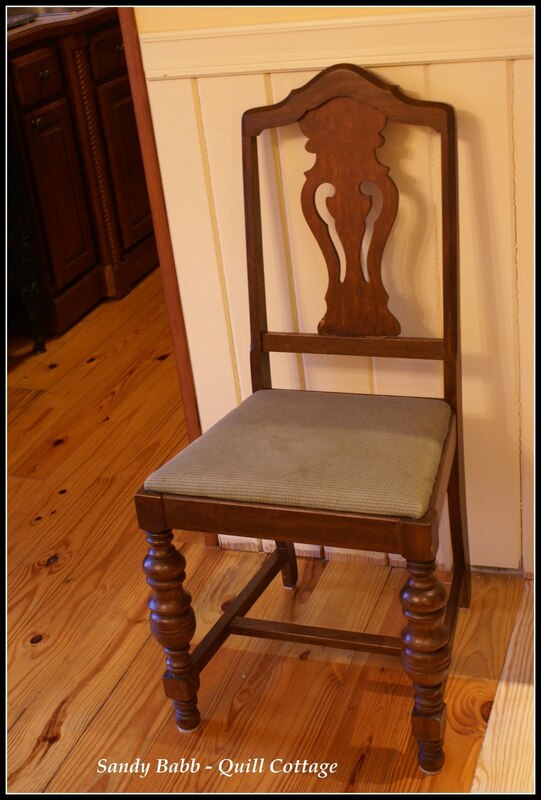 This single armed chair was reserved for the head of the household who sat at the head of the table. While it comfortably seats six, it has a built in butterfly leaf mechanism that allow for two more guests. The table slides apart and a folded leaf is flipped over and unfolds into place to allow for extra dinners. The suite is solid wood, more than likely maple, with its original stain in tact and just a couple of scratches, it is in amazing shape. 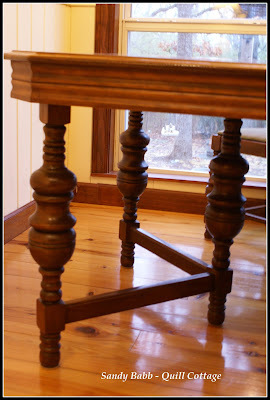 It has sturdy machine turned legs on each end that are fitted to the table top in a " V" pattern. I could not find a manufacturer marking but the table and all chairs bear the stamp underneath of: NO 400 TAP.I04-3. I have scoured the internet in hopes of finding a replacement chair for the missing one but no such luck yet. The crazy man of the house wants me to find three so that when we have guests all the chairs will match! (Dream on dear) I will be happy to at least find the one missing armless chair. I did find very close matches online but the harp back fretwork piece would be slightly different or the turn of the leg would be a little different so I am not even sure I have made a proper identification or not. If you have seen my chair or know anything about this suite that might aid me in finding my needle in the haystack I would greatly appreciate your sharing your knowledge. 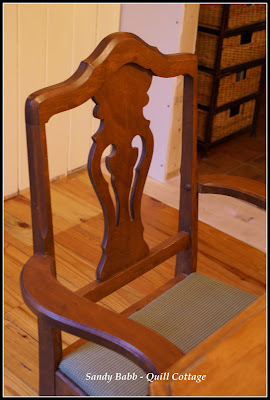 Is there a website out there for replacement chairs? In the meantime I will be visiting as many flea markets and antique stores as I can to see if I can find one. I know, its a tough job, but a girls gotta do what a girls gotta do! Thank you in advance for any assistance. I hope you are enjoying a tucked in cozy kind of day! Well I think you are off to a great start by posting great pics and info for all of blogland to help out. You know how caring all of blogland is and I am sure you will find that missing piece in no time. I just love coming to your blog, I love your descriptive story telling. I can imagine being around that table with the scene you described. Miss Sandy, have you tried Ruby Lane? Google it and go to their website...they have lots of furniture to look over! Wow! You really did well. Maybe this will be helpful.. but recently I saw a table and chair suite that did not have all of the matching chairs. They bought similar chairs and covered them with chair covers... every other one. I thought it looked great! Just an idea. My mother and father had this same set and decided to replace the chairs with sturdier ones. I couldn't believe she got rid of the chairs. My daughter now has the table and I have the matching buffet. She only paid $25.00 for the table, all the chairs, and the buffet years ago. It's a beautiful set! It is a beautiful set, I know nothing Sorry... Good luck on your quest, it will be interesting to see if you can solve the mystery... keep us posted. Thank you so much for your kind comment earlier, you are so precious. I'm sure that somewhere, somehow I've seen a matching chair but remembering where would be almost impossible. Since I have so much furniture coming and going at my house, the way I've dealt with table and chairs is none of my chairs match- I've tied their look together with matching cushions or matching colors- it works in my casual kitchen, but I don't know how it would work in a formal dining room- but it sure looks like you got a great deal! 6th chair in no time. It is a beautiful set. Hi Sandy, I'm afraid I can't help you find the missing chair but I will offer this thought. I have always loved the look of a wonderful table mixed with all different styles of chairs. A wonderful eclectic mix that each person might choose the one that suits them. Maybe some painted some slipcovered and some wood. So, if the missing chair bothers you, you could always try replacing several so they are all different!! Anyway... as I said.... just a thought! Sandy, I don't know anything about this style but you did good!!! And I think any chair with a similar back but maybe a little higher than the others would be perfect for the head of the family at the end where one is missing. It's gorgeous! My favorite part - the legs of the table! Hi Sandy: I'm a friend of Diane Knott and she sent me over to see your sweet tea pot. Try Craigslist for your chairs. THere are old sets there all the time. Check both under antiques and furniture. Good luck. You do lovely beautiful work. Isn't that the truth? Everytime I start a collection I wonder if I'll ever find the rest of it, reminds me of that commercial a few years back where the husband searches and searches on ebay for a lamp that matches his wife's vintage one. He finds one, but it ends up being his wifes....she decided to sell it since she could never find a matching one :) funny! Congrats to you and your handy hubby on the purchase of this wonderful set and for such a bargain price. My grandmother owned a very similiar set, which was left in her home when she sold it. As I recall, both ends of the table had the chairs with arms and all the rest had the regular chairs. I must find a picture if possible and send it along via email. (My grandmother's table had some sort of understructure that allowed me to take wonderful naps under there in my little house as I called it. It was very cozy with a long tablecloth draping down.